Photo: One of our faithful farmland staff is happy to show us one of the many passion fruit plants that have recently produced a half-ton harvest. 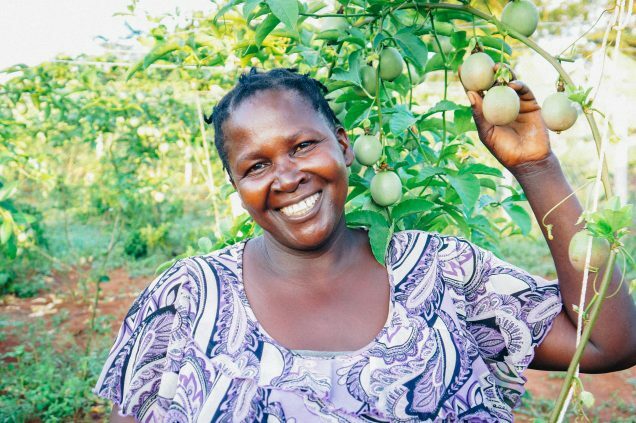 Today we bring you good news from our farmland enterprise in rural Uganda, which is flourishing thanks to our native team’s diligent hard work. In October we began to harvest our newest crop of passion fruits and so far we have gathered half a ton of this delicious fruit. The passion fruits continue to grow well and we continue to gather them daily, so we are planning to sell passion fruit juice to the local community to supplement our operating budget and work toward our goal of self-sustainability. In order to begin this new small business venture, we are seeking to raise $5,000 to purchase the juicing machine and plastic bottles, and pesticides and a spraying pump to keep our passion fruit crop, as well as other crops, healthy and vibrant for future bountiful harvests. We also recently planted tomatoes, bananas, eggplants, green peppers, mangoes, watermelons, star fruits, oranges, avocados, beans, corn, and sweet potatoes. Crops such as the avocados, mangoes, star fruits, and oranges will be ready for harvest in 2 years. Crops such as the tomatoes, eggplants, sweet potatoes, beans, and corn can be harvested twice a year — we have two planting seasons per year and these crops will be always be harvested during the two rainy seasons. Our hardworking native team has been manually irrigating the plants with watering cans every evening, which is one of the methods that the President of Uganda demonstrated recently when he visited our village. The president encouraged farmers to use irrigation methods instead of only relying on rainfall, especially since the rainy seasons often change and thus are unreliable. With your support, we are still seeking to raise $5,000 to purchase a piped irrigation system large enough for our farmland which will be a much more powerful and less labor-intensive irrigation method. We will use these organic crops to feed the children in our programs and we will sell the surplus to boost our program’s activities. We are also growing these crops in order to save money that would otherwise be spent purchasing the same food items at market. Thus, when all the crops reach full maturity and regular harvest times, we will save approximately $2,000 monthly, which is equal to about 21% of our monthly operating need. 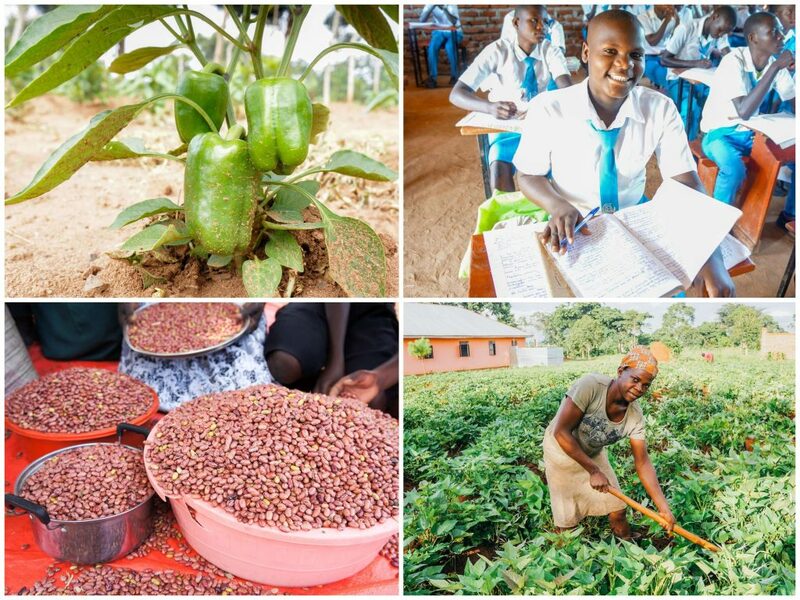 However, already, we are realizing about $1,300 monthly from the farmland, equal to about 13% of the monthly operating budget of our rural Uganda programs. Now that the students are enjoying a holiday break until February 22nd, our native team will throw them a Christmas party where they will receive a special warm meal and festive drinks, play fun games together, and every child will receive a gift. Also, some of the children will visit their relatives during the holiday, and some of the older teens will remain on campus to help keep the grounds looking beautiful and learn about agriculture while working on our farmland enterprise. These students will also enjoy Bible studies, playing soccer, putting puzzles together, and taking tours of the sights in their local community.